A fine walk in Coverdale climbing Harland Hill from Carlton before returning over Fleensop Moor and along the banks of the River Cover from Horsehouse. As I discovered over the course of a couple of walks in 2016, the village of Carlton is a good starting place for walks exploring Coverdale, one of the less celebrated valleys in the Yorkshire Dales. On one of those walks I’d nipped on to Harland Hill from the neighbouring Height of Hazely. 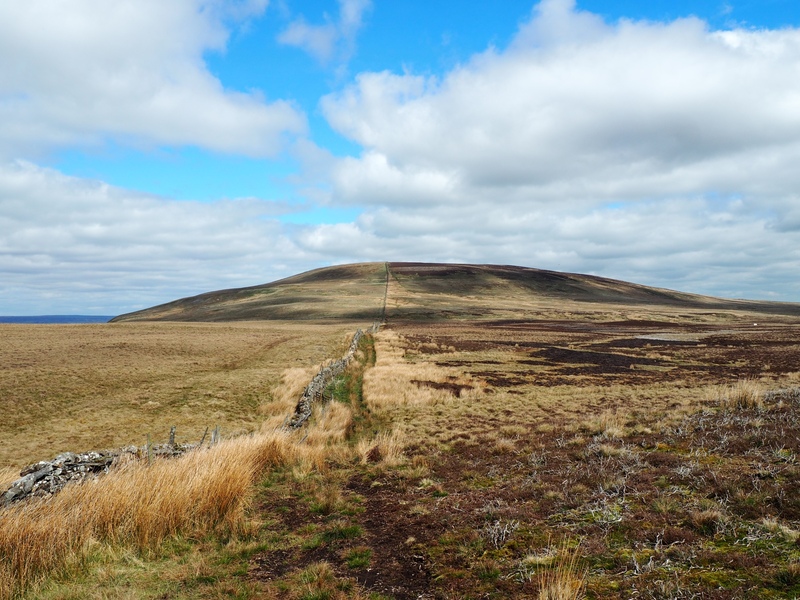 This time I wanted to climb directly on to Harland Hill before exploring some of the moors to the south. I started from the large layby in the village just before the Forester’s Arms. Walking up through to the western end of the village I was faced with the choice of bridleways, both signposted ‘West Burton 4 miles’. Having used the right hand option on my descent from Height of Hazely the previous year I decided to take the left hand option. In truth it matters not really which option one takes as they both meet at the impressive Howden Lodge, sheltered in a stand of trees below Harland Hill. The route I took was pleasant enough with good views across the valley to the likes of Great Roova and Dead Man’s Hill. At the top of the bridleway, in the saddle between Height of Hazely and Harland Hill, I turned left to follow the right hand side of the wall leading up on to Harland Hill. All in all it was an easy climb up on to the slight undistinguished summit which was marked by a small pile of stones next to a small stake in the ground. As there is little depth to the view from the summit I made my way about 100m north through the heather to get a betting sighting of Waldendale. By doing so I also got a view of Thoralby at the foot of Bishopdale and sections of Wensleydale with the distinctive shape of Addlebrough easy to identify. Returning to the summit I turned right to descend alongside the wall. For the next mile I had to cross the wall, or fence, a few times in order to avoid adjoining walls which would have been harder to manage. Eventually I reached the bridle track from Waldendale to Horsehouse. Turning left on the bridleway I followed the track as it wound its pleasant course on to Fleensop Moor. Along the way I got some good views down into the hidden valley of Fleemis Gill together with a glimpse of its solitary dwelling, the house at Fleensop. Also of note was a small detour to view the spoil heaps of Fleensop Colliery which hid, until the last moment, a couple of small buildings which presumably were also part of the colliery. Not long afterwards I came to a fork in the bridleway. With the right hand fork heading to Braidley I took the left hand option heading for Horsehouse. Almost immediately the good track I had been following deteriorated into a thin trod as it curved around on to a broad ridge. As the bridleway made a sharp right turn to descend down to Horsehouse the path disappeared into an area of reeds. Eventually I made it to the top of High Gill where a sunken path alongside the gill made its way down to the village of Horsehouse. Despite the dry conditions underfoot for most of the walk the path down High Gill was still quite slippery so care needed to be taken. At Horsehouse I got into a nice chat with one of the locals before taking some photos of St Botolph’s Church, the yard of which had a lovely display of daffodils. I couldn’t remember coming across St Botolph before so looked him up when I got home. According to the website for St Botolph’s Church in London he was an early East Anglian saint and there are over 70 churches dedicated to him. The things you learn from going out for a walk! Continuing onwards from Horsehouse I dropped down to the banks of the River Cover which I followed east for just under a mile of pleasurable walking. Just before the path left the riverbank I noticed in one of the pastures ahead what could only be described as a horde of cows. Now I’m nervous of passing only one cow so there was no way I was entering a field containing that multitude! Instead I nipped up through the field I was in to join a track, also a right of way. This brought me out on to the road just short of Gammersgill. After walking through the small hamlet I took a path through a field on the right to join Turnbeck Lane. This proved to be a superb treelined path which rather aptly came to a sudden end at Turn Beck itself. The rest of the walk consisted mainly of sheep pastures before finally crossing Goodman’s Gill for a short-lived path that brought me back into Carlton mere yards away from where I’d parked my car. Coverdale really is a lovely valley and deserves to be better known by walkers. This walk certainly opened up a few more areas of the dale that I’d not previously explored and I enjoyed every step of it.